The Final of the 2013 Meat Skills Competition took place at the Scottish Meat Meat Trade 2013 in the Dewars Centre, Perth on Sunday 12th May 2013. Butchers from throughout Scotland gathered in Perth on Sunday, 12th May to showcase the skills and craftsmanship for which their trade is renowned. Gary Raeburn, of Forbes Raeburn and Sons in Huntly, Aberdeenshire triumphed in the “Over 22” category to win the Scottish Butcher of the Year title. Andrew Peter, of Davidsons Specialist Butchers in Inverurie, emerged as the Young Butcher of the Year picking up the “Under 22” prize. Supported by the Scotch Butchers Club, which is run by Quality Meat Scotland, the Meat Skills Championship is held every second year to seek out the most skilled and creative butchers in Scotland. Around 500 people attended the event and enjoyed the opportunity to watch some of Scotland’s finest butchers at work in a competitive environment. In presenting the awards, Uel Morton, Quality Meat Scotland’s Chief Executive, said he was very impressed with the standard of the skills showcased at the event. Keith Fisher, Chief Executive of the British Pig Executive was the chairman of the judges at Meat Skills Scotland. He has immense experience as a judge on an international level but he claimed that it was always an absolute pleasure and an honour to travel to Perth to judge the Scottish event. He was a judge at the International Young Butchers Competition in Frankfurt earlier this month but he claimed that the Scottish competition's contestants were as good as anything he had seen there in the teams from England, Austria, France, Germany, Holland and Switzerland. "We took about half an hour to make our decision in the Over 22 category because the points system that we use was so close. There were literally just a few points between all four competitors in each competition. We also looked along all eight displays and considered that you could not tell which four were done by the mature butchers and which by the young butchers. That means a huge congratulations to all of them and in particular the judges who selected them to come forward to the finals." 45 entered the 2013 competition spanning the whole of Scotland from the Border to the Western Isles. Yet again the standard was very high and the judges, George Lees and Stewart Dempsie, were given a mighty task to separate the best four in each age group to through to the Finals. Eligible to take part are butchers (m/f) working in businesses in membership Scottish Federation of Meat Traders Associations or undertaking formal training with Scottish Meat Training (SMT). Competitors must agree to abide by all the rules and judges` decisions. These decisions are final and no discussion or correspondence will be entered into. Best practice in health and safety and hygiene should be portrayed. Protective apron, glove, gauntlet and footwear must be worn. The apron must be of a size to adequately protect chest, abdomen and upper leg. Participants will not be allowed to enter the competition on the day without safety equipment. Appropriate headwear must be worn. Competitors must supply all their own equipment, including knives, saw, cleaver, safety equipment (minimum chain mail apron and glove as specified above), skewers, twine, etc. A mincer and slicer will be provided on the day. Meat to be worked on will be supplied. When manufacturing value-added products, competitors must provide their own seasonings, spices, marinades, fruit, vegetables, garnishing, etc. Small quantities of additional and pre-prepared meat products can be used e.g. haggis, black pudding, bacon and sausagemeat. Competitors must supply their own meat trays, plates, salvers, bowls, or other items on which their meat cuts and finished products will be displayed. Competitors may supply and use additional non-food decorative materials or ‘props’ to enhance their display as long as they are food safe and comply with hygiene best practices. 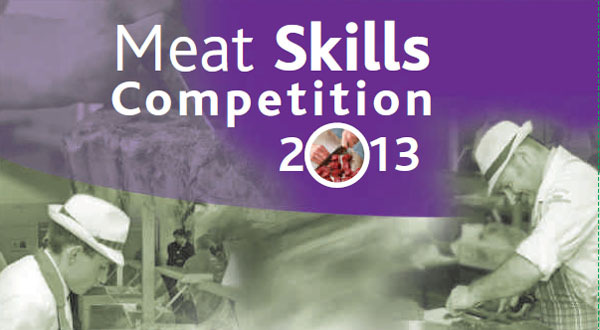 The meat props must be used within the display area of 1250mm x 680mm allowed for each competitor. Entrants will provide ticketing to merchandise their display. Ticketing will carry the following information – product name, product price, legal meat declaration. The only persons admitted to the Competition Area during the Competition are the chairperson of the Judging Panel, the members of the Judges, the competitors, and other persons responsible for the organisation of the Competition, on the day. No-one else may be present on the Competition area without the consent of the chairperson of the Judges. It is the entrants’ responsibility to ensure all equipment and surfaces used are cleaned to the appropriate standard. All competitors must agree to participate in promoting and reporting the competitions and to the use of their personal details for those purposes. Time away from work to take part in the competition is not a cost on SMT. Assessment criteria is shown on the attached judging sheet. All judging sheets remain the property of SMT. It is Scottish Meat Training’s responsibility to remove all meat products from the judging venue. Failure to adhere to any of the above rules may disqualify a competitor.